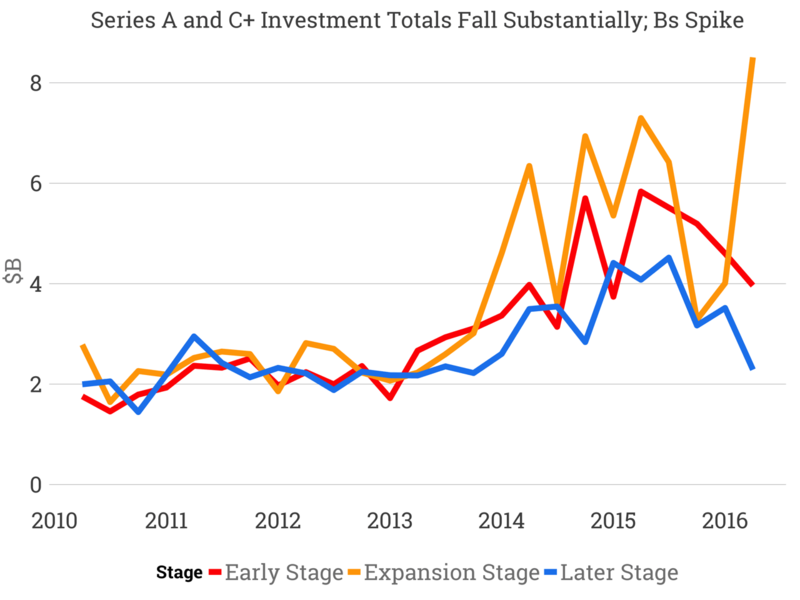 Over the last year, the amount of series A investment in US startups has fallen by nearly 33% from a high of $6 billion to about $4 billion in Q2 2016. Later stage investments have followed a similar path. Curiously, the series B/Expansion stage market has witnessed remarkable resilience, continuing to increase despite volatility. The series a market is also seen a similar drop in the total number of investments, indicating a slower investment pace. 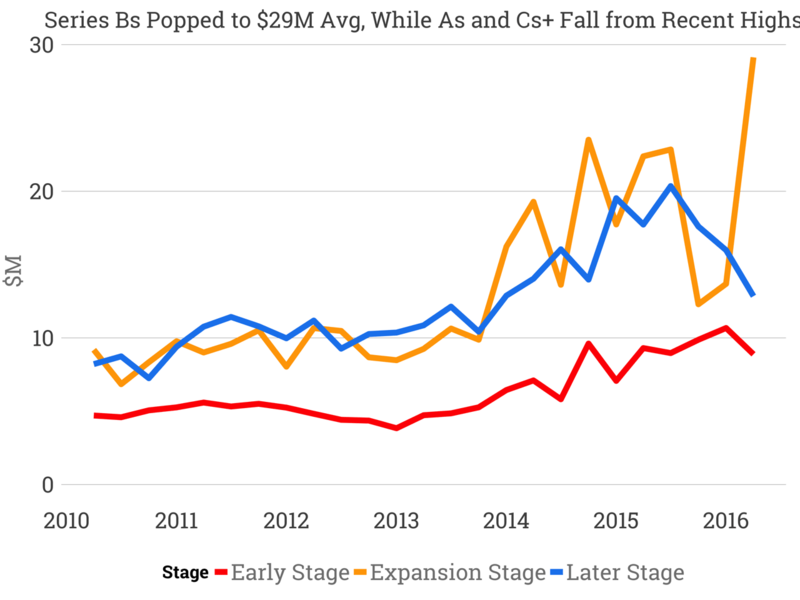 Later and expansion rounds have remained relatively constant. Series A average round sizes have fallen from their highs of just over 10 million. Later stage rounds are also falling in size. Meanwhile, series Bs spiked. In terms of sector trends, software continues its rise with nearly $10 billion invested in Q2 2016. Meanwhile consumer businesses raise less than $2 billion, a far cry from the nearly $4.8 billion raised in Q3 2015. 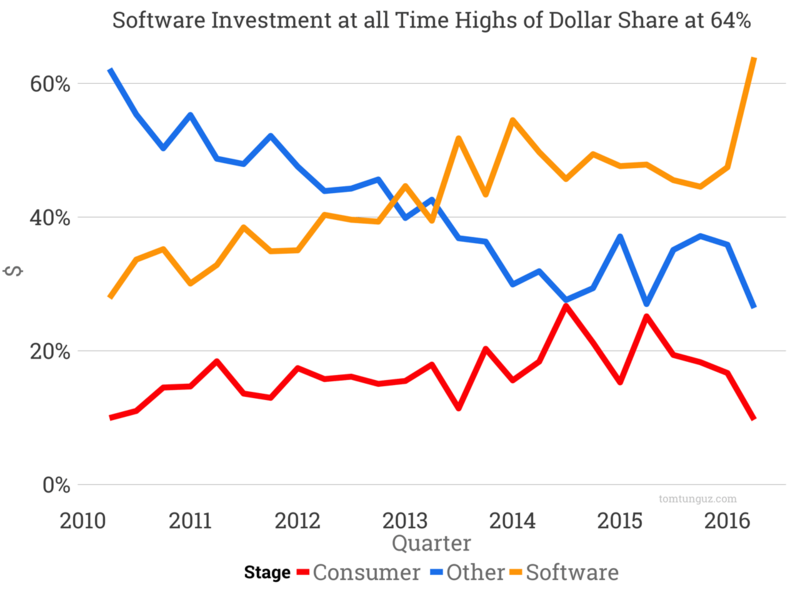 Software investments represent 64% of all venture dollars in the US, reaching all-time highs for the past six years. In short, this is a venture market in flux. The series A market is undoubtedly in decline. The series B market is booming. And later stage rounds are falling. Those trends seem incongruous, but I have a theory. Series B prices have witnessed the largest correction in the past few quarters. Because of that repricing, investors focusing at that stage are finding plenty of companies to back at attractive valuations. Meanwhile, the later stage investments are slowing because of the challenging private market, and multiple compression in the stock market. The Series A market seems to be catching its breath after an all-out sprint from 2013 to mid-2015. 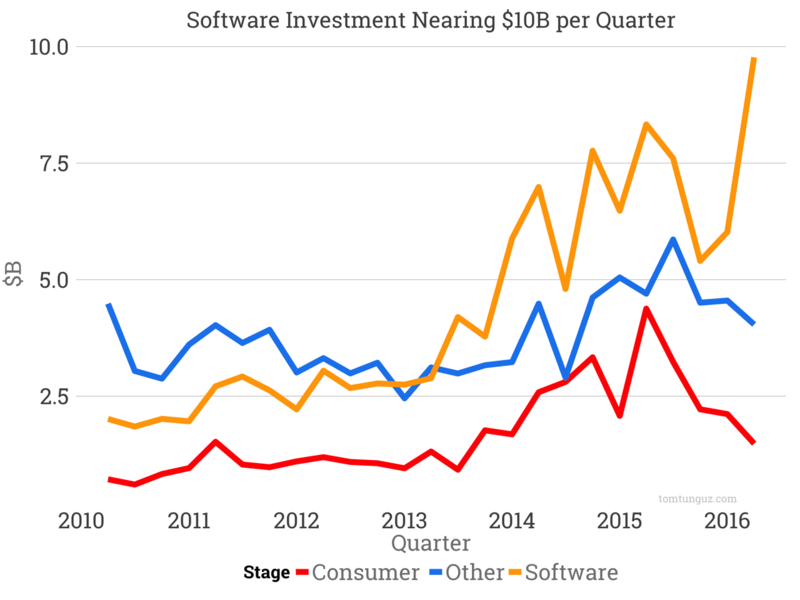 The shift to software investment is undeniable. And curiously, it comes at a time when the rates of software company formation are in decline, about 18% fewer companies year over year. Now seems to be a great time to raise a series B round, because there’s plenty of capital. Unfortunately this data doesn’t shed light into the valuations of those rounds. 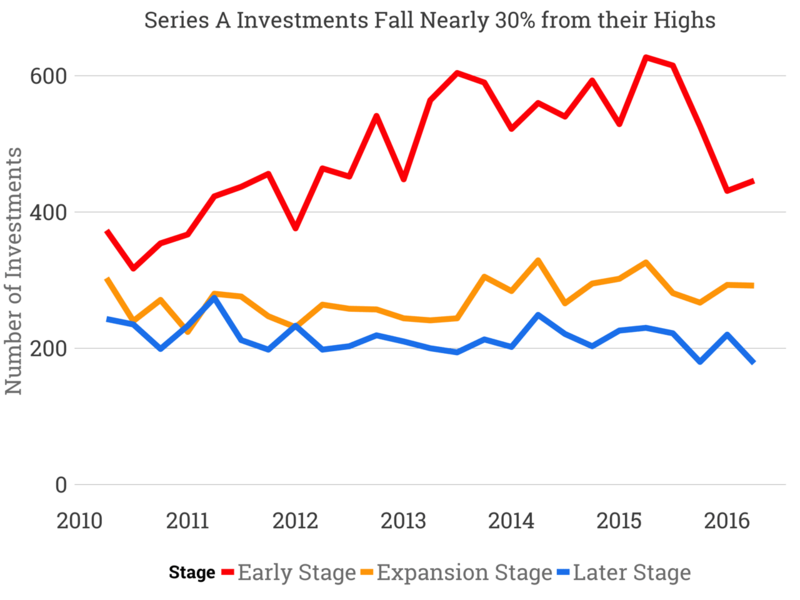 Also, the data would suggest that series A are harder to round, but I know from first-hand experience that there is plenty of Series A capital waiting for the right investment opportunity. So, I wouldn’t be surprised to see a resurgence later this year. That’s the challenge of trying to predict the future patterns of the market using previous data: There are so many different forces at play that it’s hard to isolate a single contribute factor whether it’s company formation, valuations, or investor sentiment. From my seat, it feels like the Series A market is relatively stable, but hungry for new, exciting investment opportunity.